This web page comes to you from the roadside in Brazil, 173km after Oiapoque heading towards Macapa. 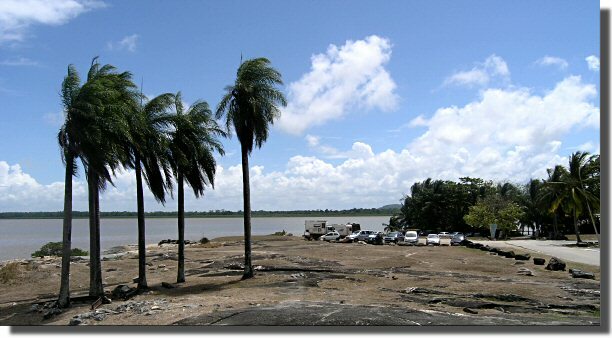 We have crossed the Oiapoque river back into Brazil. But first what of French Guiana I hear you ask? We spent a relaxed day on the coast near Mana (where thousands of giant leatherback turtles come to lay their eggs between April and July) then headed for Kourou where we parked right by the sea in a public car park (N05.158750 W52.626678); a fine parking place with the added advantage of a police hostel and water tap nearby. 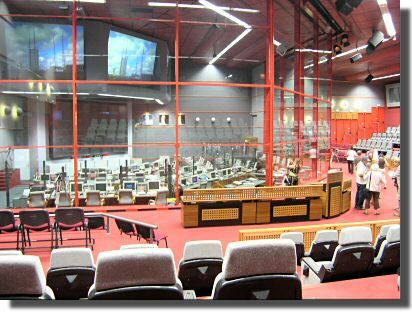 One of the main reasons for stopping at Kourou was to organise a visit to the European Space Agency's launch facility. Although the tours are free you have to book in advance (visites.csg@wanadoo.fr) and take your passport with you. Tours last about three hours and are only in French. Compared with similar tours of NASA facilities in the USA, this one was something of a disappointment with very little drama and lots of "company" propaganda. Did you know that more than half the world's communications satellites were put in orbit by Ariane, or that the ESA's launch location near the equator means that the cost per kg into geostationary orbits is up to 40% less than other operators? After our tour we moved on to Cayenne, the capital of French Guiana. 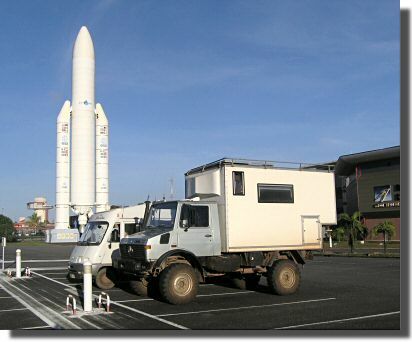 Again we parked on the waterfront, this time in a car park at the rear of Conseil General de Guyane on Rue C. Chandon at N04.939580 W52.336290. The police enquired how long we intended to stay, but other than that we were not disturbed. Probably the best reason for stopping in Cayenne is the combined bar, restaurant and cyber-cafe on the Place des Palmistes . The food, and the prices, were up to French standards. 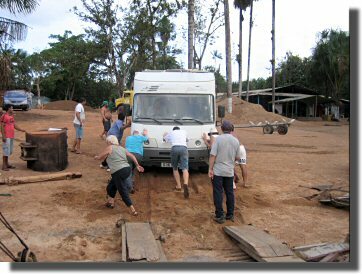 From the earliest stages of planning this trip there has been doubt about whether it would be possible to get our vehicles from French Guiana to Brazil. Searches on the Internet produced evidence that there was a passenger ferry, but very unusually, we could find no reference to anybody getting a vehicle larger than a motor bike across the Oiapoque river. Two generally good sources of information, the South American Explorers Club and the Thorn Tree produced negative results. No roads between Cayenne and the border. There might be trails, but I wouldn't count on them, and definitely no bridges or ferries. Several other respondents on Thorn Tree said that since no camper van would make it from Lethem to Georgetown it didn't matter that there was no ferry across the Oiapoque river! The truth is that the road from Cayenne to St. Georges is good tarmac and the ferry at Regina has been replaced by a splendid bridge. 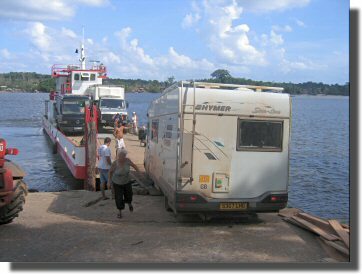 When we arrived in St. Georges, we drove down to the river bank and reported to customs (N03.887534 W51.801750), who explained that because we were from the EU and French Guiana is part of France, there were no customs formalities. 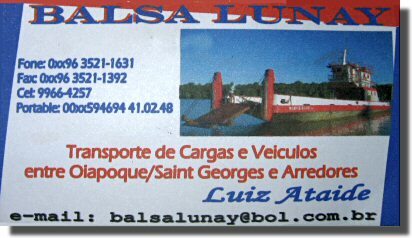 If you ask, customs may phone Luiz on the Brazilian side of the river to come over in his ferry and collect you. If not, you can call him yourself at one of the numbers on his card (above) or +55 96 99617608 (a Brazilian mobile number) or 0694410248 (a French Guiana number). Alternatively, if your Portuguese is not good, you may chose to call Stefan in Oiapoque to help you (see below). Whilst we were waiting for the ferry, we walked back into St. Georges to the new police station (N03.889895 W51.804033) where they stamped our passports out of French Guiana. They told us that we were the first campervans to cross this border. The ferry, which is in good condition, took about an hour to arrive. There is a steep concrete loading ramp on the French side (200 metres from customs) and a sandy beach on the Brazilian side. We were charged 150 Euros per vehicle for the crossing. Disembarking on the Brazilian side, we immediately presented our vehicle papers and yellow fever vaccination certificates to the official whom Luiz had summoned. After that, we needed to report to the police (N03.843180 W51.835000) for immigration formalities, and then on to customs, who required a list of all our electronic equipment and cameras (N03.849049 W51.831445). We were allowed to park overnight (free of charge) in the ferry compound under the palm trees (N03.843757 W51.839417). 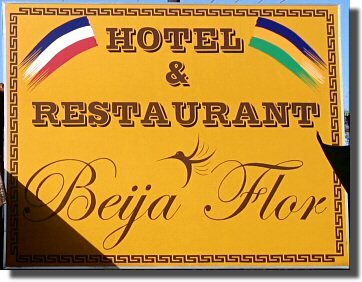 To celebrate our arrival in Brazil, we walked to the splendid restaurant Beija Flor run by the very helpful Stefan. Both the restaurant and the piranha soup are highly recommended.